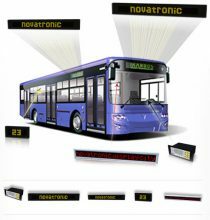 NovaBus ia a new comprehensive passenger information system designed to be used in different types of public transport vehicles. 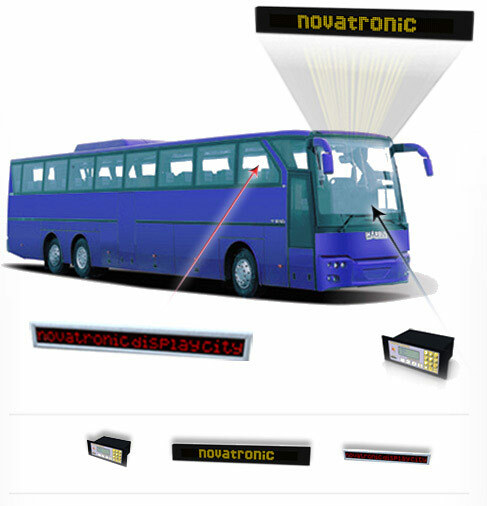 NovaBus system is advanced, reliable and easy-to-install, use and maintain. 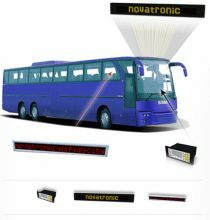 Our displays are manufactured on basis of high – brightness LED elements which ensure excellent displaying characteristics, high endurance and long lifetime. 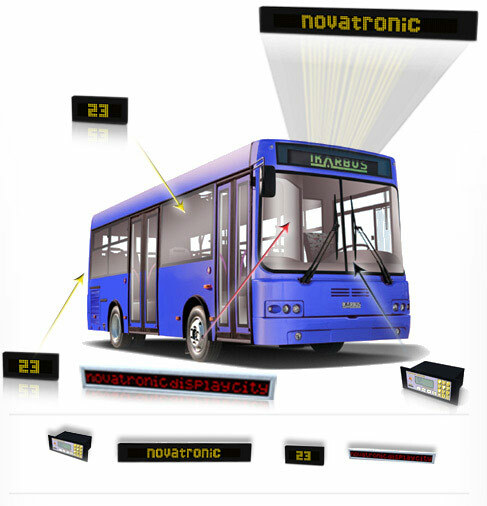 NovaBus system is a quick and effective way to provide fast and accurate information in real time. (e1 mark and EN50155). 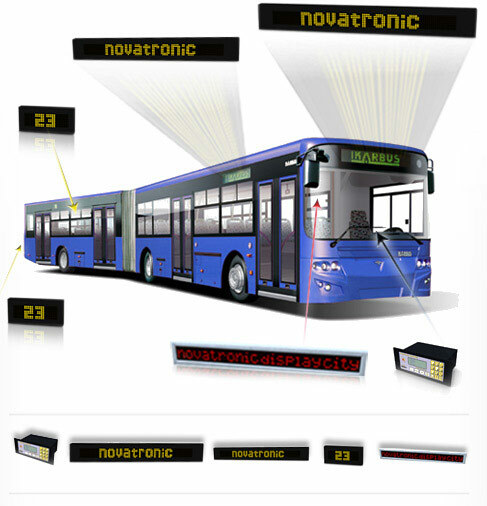 Variety of resolutions, dimensions, communication interfaces, open standard and proprietary communication protocols allows easy installation and integration of Novatronic’s destination displays. Our interior LED displays provide next-stop information, services, destination information, warning and advertising messages in highly visible format. signs and comply with same standards. High brightness indoor TFT monitors in various dimensions, HD resolutions, in normal or stretched sizes, from 12.1” to 38”. Slave monitors with video interfaces or Master monitors with embedded PC (OS Linux or Windows CE) and various communication interfaces, supporting next stop announcements, multimedia contents (related to particular stops), web pages etc. 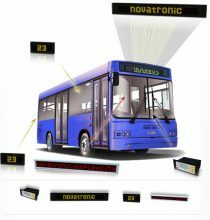 Controls all displays in NovaBus system through various communication interfaces enabling driver to easily choose the desired options. It is user-friendly, multilingual, compact and suitable for standardized instalation on dashboard (ISO 7736). Supports preloaded device content creation (in back-offi ce SW) and manual system control (by driver), aswell as easy integration with 3rd party ITS/AVL/e-ticketing systems through cutting edge text rendering software. NovaBus software has multilingual user interface, supports creation of various graphical and textual inscriptions for all the Novatronic’s signs, with real time simulations. 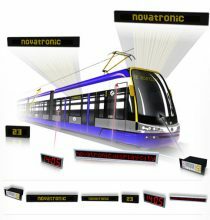 Supports AVL passenger information system based on GPS and odometer data through textual information on internal displays and monitors, as well as audio announcements. The number of characters which are visible at the same time is dependable from the horizontal resolution. The distance of dots between each other is 12 mm. Vertical resolution is 8 dots, and the horizontal resolution for standard models is 96, 72, 48 and 24 color dots. NBAL 16 serves for displaying line number and destination. It is usually mounted in the front, or on the side or in the back of the vehicle. Number of installed NBAL displays can vary regarding of client needs – max number is 15 devices. The display is produced in LED technology, the color of the diots is amber with 10 mm distance between each other. Vertical resolutioon is 16 dots. Horizontal resolution for standard models is 140, 112, 84, 56 and 28 color dots. It is possible to display the number of line and destination,also it can display text in two lines. If a description of the destination is longer it can be displayed as a scrolling message or the destinations can be altered in configurable times. NBAL 17 display serves for displaying line number and destination. It is usually mounted in the front, or on the side or in the back of the vehicle. Number of installed NBAL displays can vary regarding of client needs – max number is 15 devices. 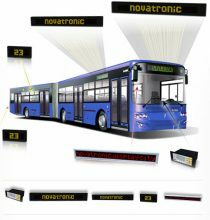 The display is produced in LED technology, the color of the dots is amber with 13,3 mm vertical distance between LED and 10,2 mm horizontal distance between LED. Vertical resolution is 17 dots. Horizontal resolution for standard models is 144, 128, 96, 64 and 32 color dots. NBCOL 17 serves for displaying the line number, destination and additional information necessary to the passengers. It is usually mounted in the front, or on the side or in the back of the vehicle. All the displays are together conected in the LAN network, so the number of instaled displays is unlimited. 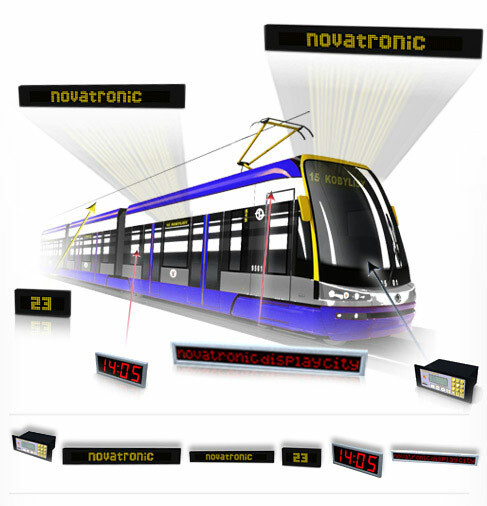 Display is produced in LED technology, the color of the dots is amber with 8,6 mm distance between each other. Vertical resolution is 21 dots. Horizontal resolution for standard models is 170, 160, 136, 128, 102, 96, 34 and 32 dots. It is possible to display line number and destination, next stop, arrival time and informational messages. Displey has 3 completely independent zones and in every of these three zones text or graphic can be displayed independently. This display can be called a HI RESOUTION solution.